These objects are compatible with patches 1.66 - 1.67. Again, these objects require my Custom Food Script mod, or they will not work in your game. These objects do not require any Expansion or Stuff Packs. Found in Buy Mode > Sort by Function > Appliances > Miscellaneous Appliances. 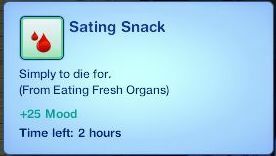 These objects provide four custom moodlets (requires Custom Food Script mod) for your sims! Do not feed to vegetarians. Place the objects in your Mods\Packages folder or wherever you keep your mods. Place Collection_Nona_RawMeats.package in Collections\User if you wish to use the collection file in game. Download and install the Custom Food Script mod in Mods\Packages. 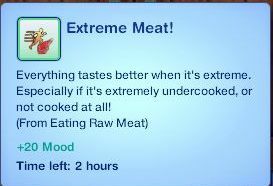 Note: If you want your non-Vampires and non-Werewolves to be able to eat the raw meats, download and install the optional NonaEdibleFood_RawMeatForAll_Tuning available with my Custom Food Script mod. Additional Credits: Cmo, for meshing the objects for me. Thank you, cmo! Sandy @ ATS3 for first sharing how she made her own custom edible food. TFM for coming up with the idea of hearts and livers and Vampires. Also, many thanks to Inge, Consort, SimsLover, OM, a, and Bloom for always providing me with input.